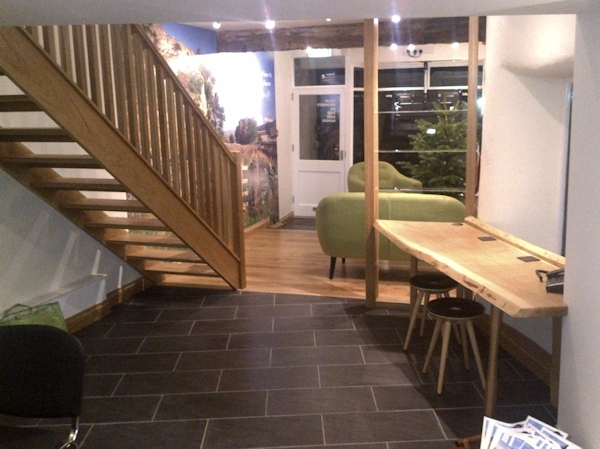 R&B Building Services carried out this extensive refurbishment and full fit-out of a former retail shop in Grassington, North Yorkshire for cottages.com. The project included stripping out all ceilings, wall and floor coverings and removal of the existing staircase. We completely re-wired the property and installed new wall & water heaters and a new lighting system. We also made and fitted a bespoke oak staircase. In addition to full re-plastering, we installed a new kitchen, new toilet facility, wood burning stove & surround and re-decorated and put down new floor coverings. We fitted all new office furniture including desks, seating and hand-made oak shelving and installed new data and voice points. This project was particularly challenging due to the time scales set by our client, we had a 5 week deadline to complete this project – which we met with two days to spare.